Handling our resources responsibly is one of THE major challenges of our times – that is a well-known fact by now. For this reason, national and international environmental and waste management laws are making increasingly stricter demands when it comes to waste avoidance, waste treatment and product responsibility, and are pursuing ambitious secondary raw material use targets. Not least, the increasing world-wide energy scarcity and the rising energy prices already indicate future raw material shortages. The development from pure waste management towards qualified resource management is therefore not only a sustainable and ecological necessity but also of major importance in financial terms. That is the premise for the business activities of ASCON Gesellschaft für Abfall und Sekundärrohstoff Consulting mbH. Product responsibility and the management of the various different waste flows apply to the entire spectrum of products introduced to the product cycle and represent huge challenges for waste producers. For over 20 years, the ASCON GmbH team of consultants has developed efficient, flexible and innovative concepts and solutions for handling secondary raw materials in a way that is sustainable and also financially profitable. ASCON also has an excellent operational structure in place; we have become specialists for the world-wide collection, sorting, treatment, recycling and marketing of secondary raw materials. 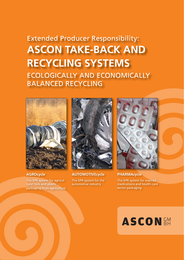 In addition, ASCON runs its own recyclables recovery and recycling systems that operate throughout Germany.